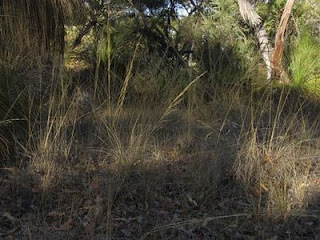 Shenton Bushland Activities: Do I hear a wedding bush? Visited the site of a mound we removed which has been colonised by some native grasses (Austrostipa sp. rather than weeds for a change. Also came across a shrub that we didn't recognize. I think it is Rinocarpus glauga (Wedding bush) - must come back in October to see if it is in flower. John and I pulled out veldgrass when not looking at plants.